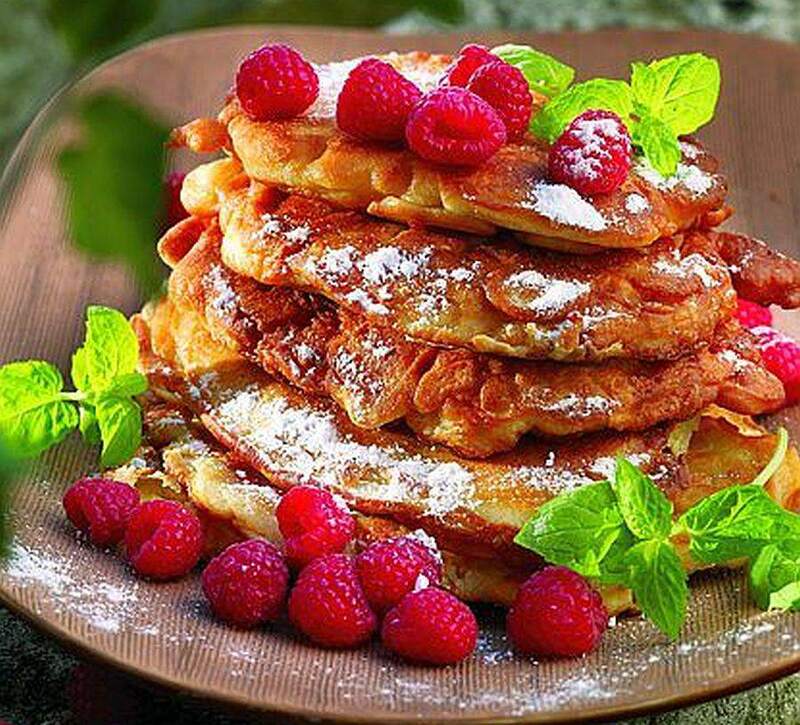 This Polish Apple Pancakes Recipe or Racuchy Z Jabłkami (rrah-TSOO-hih z jah-boo-KAH-mee) is featured in two of chef Bogdan Gałązka's books --"The Taste of Gothic" (AWRT, 2015) and "The Cuisine of the Teutonic Grand Masters in Malbork Castle" (Multico, 2009). He has also written "The Cuisine of the Kings of Poland in Malbork Castle" (Multico, 2010). This chef-historian is the co-owner and chef of the Gothic Café & Restaurant in Malbork Castle, the largest brick castle in the world near Gdansk, Poland, and the Baltic Sea. You might enjoy hearing chef Bogdan talk about shrimp in medieval Poland here. Apple fritters or pancakes are common in Poland but this one is made with yeast. While typical yeast doughs take about an hour to rise, the only rising required for this recipe is about 15 minutes for the sponge. To make the sponge: Mix the yeast with .17 ounces/5 g sugar and let stand in a warm place to rise. To make the pancake batter: Whisk the eggs with vanilla sugar and 5 ounces/145 g of sugar. Gradually add milk, flour, a pinch of salt and the risen yeast sponge. Using a wooden spoon, mix all the ingredients thoroughly and work the batter until air bubbles appear in it. Wash and peel 17.6 ounces/500 g apples and remove the seeds. Cut them into slices and submerge them in the batter and set aside in a warm place. Heat the oil in a large skillet and, using a spoon, add the batter with the slices of apple in the form of small pancakes. Fry over very low heat, turning from time to time to ensure they do not brown too much. To make the apple-cinnamon sauce: Wash and peel 17.6 ounces/500 g apples, remove the seeds and cut into slices. Pour the apple juice into a saucepan, add the apple slices, along with 1 ounce/30 g of sugar and cinnamon, and cook until the apples are soft. Put this into a mixer and blend to a smooth consistency. To serve: Serve the pancakes warm with a sprinkle of confectioners' sugar, fresh fruit and the cinnamon-apple sauce.